You are here: Home » Historic Preservation Update: Think you can survive one night as a 1929 Tama County historical character? Historic Preservation Update: Think you can survive one night as a 1929 Tama County historical character? We dare you to come prove it at a Murder Mystery Dinner! On Sat. Oct 30, 6 – 9 p.m. at Pilgrim Heights, Tama County Historic Preservation and Convention & Visitors Bureau is hosting a Murder Mystery Dinner event straight from the Tama County history books. 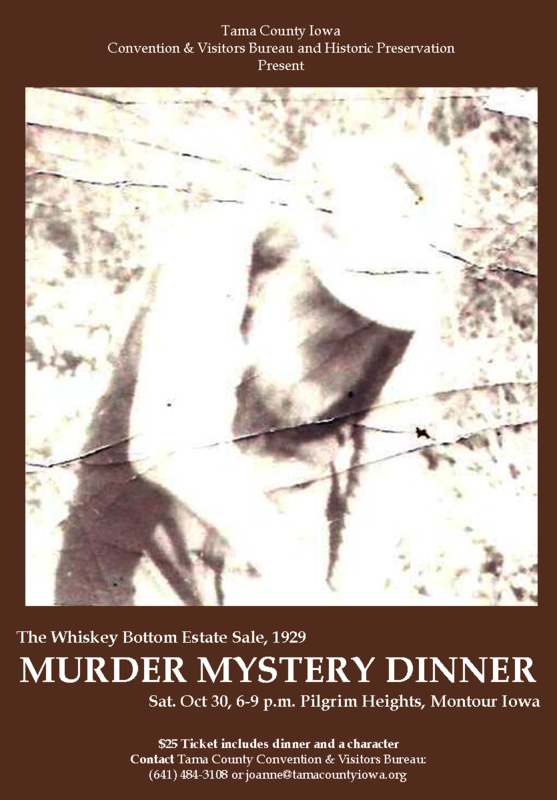 The 1929 murder at Whiskey Bottom (in rural Tama County around Pilgrim Heights Camp and Retreat Center) has never been solved, but that my all change at this estate sale full of characters, good old fashioned Tama County food and hospitality. Each attendee will be given a 1929 character inspired by the Tama County history books, info to share, and secrets to protect (but no lies allowed!!!). For eight weeks, starting next week, clues to the story and your character will appear in the Tama/Grundy Newspapers and/or online: www.tamacountyiowa.org/mystery2010. Also keep an ear out for radio interviews with members of the creative team. Actors: The creative team has identified a need for 8 actors (4 males, 4 females) to help carry the story and move the plot forward for the night. Open auditions in the form of improv games will be Sat. Sep 18, 2 p.m. at Pilgrim Heights. Hope you can join us and be a part of this experience too. ← Entrepreneurship Update: What could be more valuable than free money?